In the early winter months of 2010, I found this Jeep J-10 pickup. 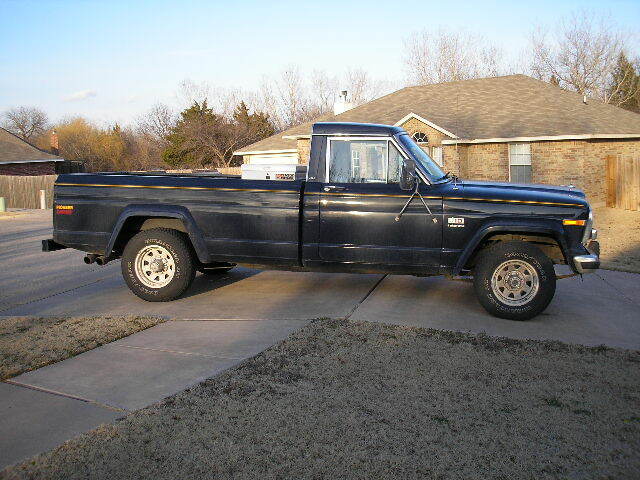 It's in remarkably good shape for a 24 year old truck. Then again, it only had 52,000 miles on it when I bought it. The previous owner told me the original owner only used it to tow a camper once in a while. So it ended up sitting in a garage for most of its life. I am never one who can just leave well enough alone. 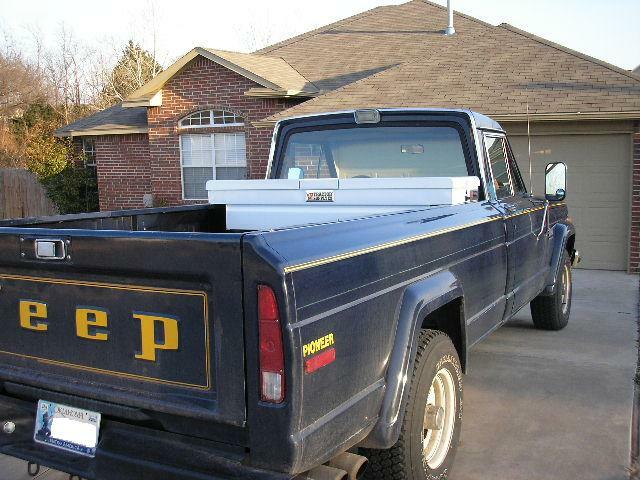 So naturally, I started customizing this truck shortly after I bought it. Since this truck will be used as a truck, I decided I neede to have some things with me. A few basic tools, some jumper cables, straps for securing loads in the bed, etc. Trouble is, this is a regular cab truck so there's not much room in the cab for all this stuff. So I went ahead and put a truck box in the truck. Because full size trucks these days are bigger than they used to be, I ended up using a truck box designed for a compact pickup. It's just a touch small for my truck but it fits and it holds what I want to keep with me. There's plenty of room under it to fit 4x8 sheets of plywood when I feel like doing some construction. Shortly after I bought the truck, I decided to try out the cassette player. It worked fine for a while but then catastrophe struck. It ate a cassette. And not just any cassette. It was my original copy of the Miami Vice soundtrack. I was devistated. Well, not really. I have a copy on CD. So after that, I put serious effort into finding an inexpensive CD player and some better speakers. I don't have any pictures of the installation but I'll get them sooner or later. After getting the CD player installed, I decided to install a CB radio. 10-4 good buddy, a CB. I know. It's passe. But it's actually useful when you have a couple of Jeeps on the trail. It's a lot easier to talk to each other when you're in the middle of nowhere with spotty cell phone coverage. And it doesn't cost any minutes to use them whenever you want. Besides, listening to the truckers on the highway can be entertaining. Once the CB was up and running, I decided to get rid of the very loud glasspack mufflers the previous owner had installed. In their place, I installed a quiet Flowmaster muffler. It has a distinct tone without being so overly loud. The noise level in the truck dropped dramatically on the highway and I can really hear the CD player without having to turn it up to eleven. Once the basics were covered, I turned to the engine. AMC sourced their ignition systems from Ford. 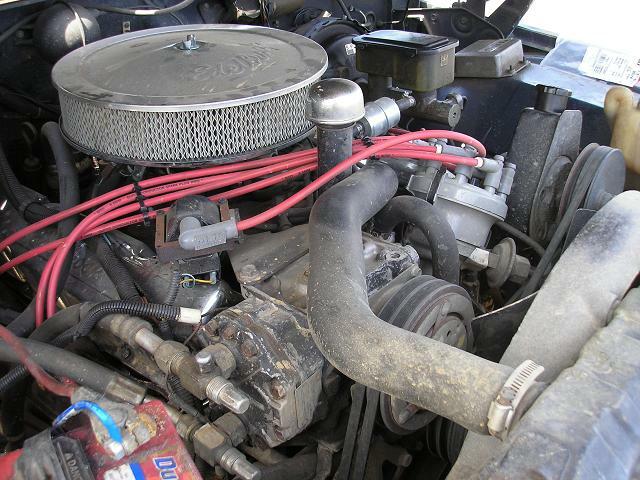 The venerable Motorcraft Duraspark system was fine for the 1970's but by the 1980's Ford had already upgraded. Unfortunately, AMC did not follow suit so the engine was stuck with an outdated ignition system from the day it rolled off the assembly line. Fortunately, it's quite easy to use off the shelf parts to upgrade from the old Ford Duraspark to the newer Ford TFI system. The upgrade involves using a cap adapter, rotor, coil, plugs, and new wires. It's an easy upgrade that adds a bit of pep to the engine, improving throttle response and adding slightly to the mileage the engine can get. The best part is that anyone can do the upgrade in their driveway with simple hand tools in an hour or two. I've done a writeup of the procedure along with several pictures. Once I got the truck moving, I decided to work on getting it to stop reliably. The brakes were worn and I would get a slight vibration when I stepped on the pedal. So it was time to do a complete brake job. The rear brakes were pretty straight forward. I replaced the drums and the brake shoes, making sure to adjust the parking brake correctly. The front was a little more involved. In order to address the vibration I felt while braking, I needed to replace the brake rotors which involves removing the hubs entirely. And, as most mechanics will tell you, there's several things that are a good idea to to "while you're in there". So I decided to just go ahead and replace the hubs and rotors as an assembly and put completely new wheel bearings in, making the axle like new. And, like the TFI upgrade, I did a writeup of the proccess. Once I finished the disc brake replacement, I found a new job in another state and packed up everything to head back to my home town of Cedar Rapids, IA. But from there, the projects continued. I've made progress making this truck my own. After I settled into the new house, I ran across a great deal on some axles from a J20. I decided to plan a full set of upgrades that integrated this new set of axles. I wanted to lift the truck a little, add bigger tires and, of course, change gears to compensate. And while I was doing the gears I might as well add some lockers. With the long term plan of adding an overdrive automatic, I chose some gears that weren't so highway friendly. Naturally, I kept going with the "as long as I'm doing the work" philosophy and put in several upgrades on the axles before they went under the truck. The front axle received new ball joints, upgraded chrome molly axle shafts, and a set of heavy duty disc brakes. In the rear I decided to swap out the factory drum brakes for a set of discs, using the same type of upgrade that you would find on a full float GM 14 bolt using calipers from a 1978 El Dorado. I've done a write up on what I did for that project as well. About the same time as I was doing the axles, I found a good deal on a heavy duty hitch receiver. I was able to get the hitch, get it powder coated and installed in the truck. I have a trailer brake controller ready to install but I need to run the wires and get it mounted under the dash. 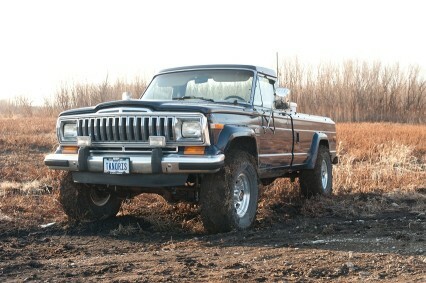 Once I get that done I'll be ready to tow my CJ and/or JK out to the trails and back, at least here in the flat lands. The truck probably won't be the best tow vehicle if I ever go to the mountains but there aren't any mountains anywhere near me. After the axles and tires were in place and working, I started on some more significant upgrades. Unfortunately, the upgrades have stalled for over a year but when we thaw out this spring I'll be getting back to work to wrap up these upgrades and get the truck back on the road. The first of the two halves of the project are replacing the factory 3 speed automatic with a 4 speed automatic with overdrive. Since there was never an overdrive automatic offered behind the AMC V8 engines, the only choice was to adapt one from another application. I could have used the automatic behind the 6 cylinder AMC engines but I plan on doing some heavy towing and the medium duty transmission would not have been up to the task. Instead, I'm adapting a TH700R4 transmission from a GM truck. I have used two adapters from Novak Conversions. The first has an adapter ring that lets the transmission bolt to the engine, along with a custom flex plate that will mate the AMC engine to the GM torque converter. 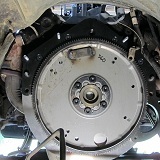 The second adapter allows me to use my Jeep transfer case. It comes with the adapter housing to go between the transmssion and transfer case as well as a new input shaft for the transfer case so that it will mate with the output shaft of the transmission. Using this kit involves rebuilding the transfer case but it's a good opportunity to replace all of the bearings as well as the chain which stretches over the decades. I've gotten as far as getting the transmission in place and mounting the transfer case. I've determined I can reuse some existing factory bolt holes for the transmission crossmember so I don't have to fabricate anything for that. However, I still have to hook up the transmission cooler lines and the throttle position cable, install the wiring for the lock up torque converter, adapt the starter to the bell housing, adapt the transfer case shift linkage, adapt the transmission shifter (or replace it with a floor mounted unit), and modify both front and rear driveshafts to fit. So it will take me a couple of weekends once the garage is warm enough to work in. The other half of the project is installing a throttle body fuel injection system on the motor. I'm using a Holley Avenger TBI system. It's a self tuning fuel injection system that should give me both more power and better fuel economy than the factory carburetor. I don't expect miracles but every little bit helps. Along with the fuel injection system, I had to install a new intake manifold so I am going with a standard Edelbrock performer manifold which will be well balanced with my stock camshaft and fuel injection system. I've decided to modify the ignition system to let the fuel injection computer control the timing. I've done some custom modification of the distributor to lock out the mechanical advance as well as wiring in the ignition controller from a GM HEI ignition system used for their TBI applications. Like every other project I start, I've done the "as long as I'm in here" work. Since I had to install a new intake manifold, I had to drain the coolant. And as long as that's drained, I might as well replace the radiator. And while the radiator is out, why not rebuild the air conditioning system since I can get to the condenser? And as long as you're doing that, why not switch from a York to a Sanden compressor? And why not upgrade from R12 to R134a? And why not replace the water pump while all of those brackets are taken off and the coolant is drained? And while the engine driven fan is off, why not swap over to a two stage electric fan along with a heavier duty alternator? Well, when you do that, you take a lot longer since you have to customize several of the parts and buy some expensive tools to get some of the jobs done. So until it warms up, the project is only half finished. 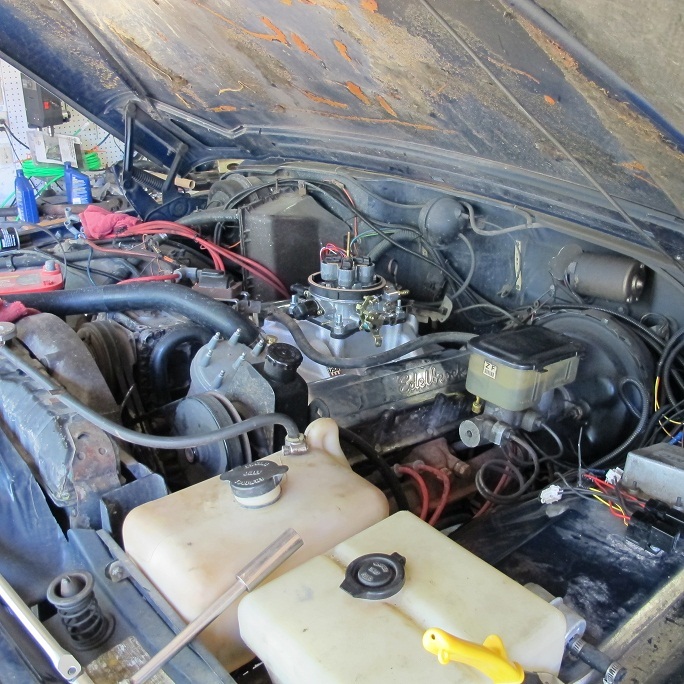 The water pump, alternator and A/C compressor are installed. The A/C condenser is in place but not fully hooked up. The intake manifold is on and the ignition system is in place, along with the throttle body and fuel system modifications. But I need to finish buttoning up the A/C system and get the cooling system finished up before I can fire everything up. But that's going to have to wait until the weather warms up a bit. Once the engine and transmission work are done, I'm going to just focus on driving the truck for a few years and put my attention into my other Jeeps.